The art of Genoa—the Italian port on the Ligurian Sea and the counterpoise to Venice, the more esteemed port city opposite on the Adriatic—is still not known or appreciated well enough in the United States as it should be. That holds true particularly for the 17th-century Genoese artist who is currently featured in the National Gallery of Art’s exhibition The Baroque Genius of Giovanni Benedetto Castiglione. Why should we concern ourselves about the artistic achievements of this port city? Well, first of all because, doubtless for its wealth derived from trade and exploration (it was after all Christopher Columbus’ hometown) and its location as gateway and nexus of routes from France, Spain and the rest of the Italian peninsula, it was a cultural and economic magnet. It drew some of the greatest artists of the 17th century: Caravaggio, Rubens, and Van Dyck. Secondly, it reflects a short but fascinating and significant chapter of the discipline of art history in this country. A small coterie of collectors, curators and museums has sustained an appreciation of Genoese Renaissance and Baroque art. One of these, Jonathan Bober, is the curator of the present exhibition, who before coming to the National Gallery, was many years at the Blanton Museum of the University of Texas, Austin. While there he acquired en bloc the renowned Suida-Manning Collection, formed by legendary art historian Wilhelm Suida, his daughter Bertina and her husband Robert Manning. They were the chief protagonists for the appreciation of Genoese art in America and collected in this area extensively (documented in the exhibition catalogue, Capolavori della Suida-Manning Collection, Museo Civico, Cremona, 2001). Thanks to them and others, several seminal exhibitions were held, largely drawn from their collection, which revealed to American audiences beginning in the 1960s and ‘70s the importance of Genoese art. The most recent of these—Genoa: Drawings and Prints, 1530-1800—was held at the Metropolitan Museum of Art in 1996 (which I reviewed for APOLLO Magazine, October 1996). It included a large number of works from the Suida-Manning Collection, and many Castigliones. An important difference between the Met’s show and the present exhibition was not only the focus on Castiglione himself, but the examination of his influences and his legacy. The exhibition includes around eighty drawings and prints and is divided into obvious but apt sections. The first is a subject most largely associated with Castiglione, his interest in animals, grouping them in procession-like arrangements in his prints, drawings and paintings. The show opens with a fine, signed pen-and-black-ink drawing by Castiglione’s teacher, Sinibaldo Scorza, done around 1620, which is an antecedent for Castiglione’s own compositions. While the latter perfected these varied groupings of animals as a “sub-genre” unto itself, often a story, such as Scorza’s Orpheus charming the animals with his music, was the point of departure. In his drawing, Scorza limns a marvelous porcupine, ostrich, and, above in a tree, a peacock. 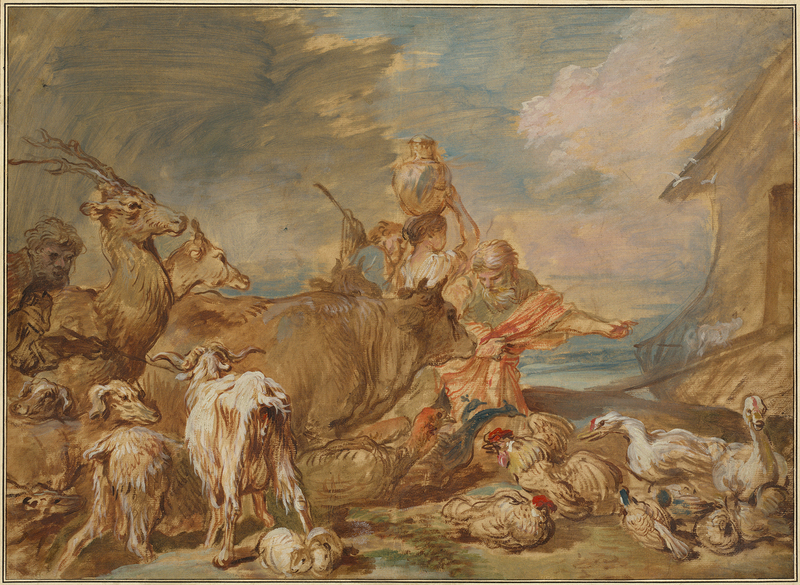 Alternatively, Castiglione often used the story of Noah and the ark of animals, seen to brilliant effect in the oil and brush on paper drawing, Noah leading the animals into the Ark, c. 1655 (see above left). These animal compositions participate in the highly influential pastoral tradition of the Venetian Renaissance, demonstrated here with the famous woodcut by Nicolò Boldrini after Titian’s composition of a landscape with milkmaid from the 1530s. The celebration of the landscape and rural life was one of the main preoccupations of the Venetian Renaissance—both in painting and in literature—and the fusion of the two informs Castiglione’s poetic approach. This was not lost on subsequent artists, as we see here with 18th-century French examples by François-André Vincent and François Boucher. This emphasis on animals and the pastoral segues effortlessly into the section treating Castiglione’s love of the Antique and his appropriations thereof. Castiglione had travelled throughout Italy and naturally spent time in Rome. 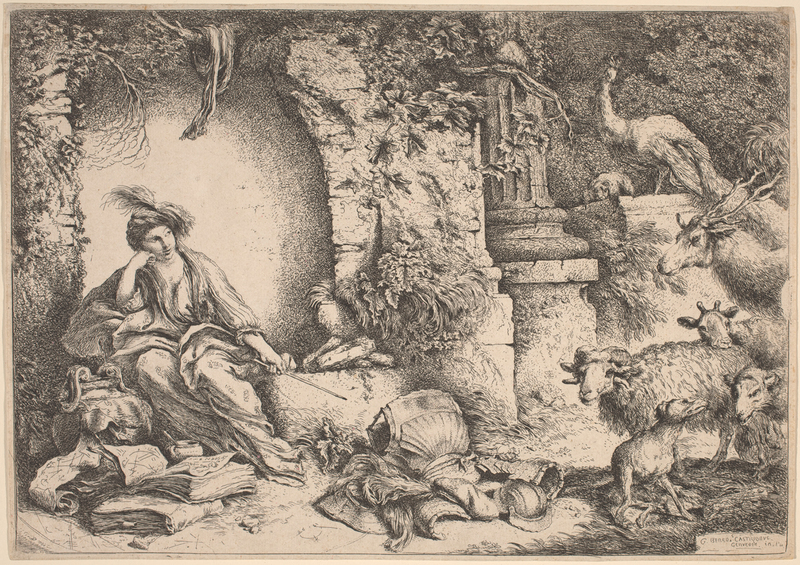 In addition to being one of the greatest draftsmen, Castiglione was a superb printmaker—inventive in both mediums as we shall discuss—and one of his greatest and best known prints combines his love of Antiquity with his animal subjects, Circe Changing Ulysses’ Men into Beasts, (1650/55; see above right). Netherlandish art was widely influential in Genoa—not surprising given its trade connections to Northern Europe—and Castiglione’s interest in animal subjects, landscape, and still life can in part be traced to this. The artist, whenever the opportunity arose, took the occasion to depict marvelous still lifes, such as we see here with the pile of empty armor in center foreground. Of course, in this story taken from Homer’s Odyssey of the sorceress Circe’s enchantment of Ulysses’ men, this armor was shed by a soldier now doubtless one of the beasts to the right. Circe’s amused demeanor here, as she lounges surveying her bestial subjects, is just icing on the cake. Numerous other examples in this section on Castiglione and the Antique show how influential his vision of the Classical World was on artists ranging from the great recorder of Rome old and new, Giambattista Piranesi, to the 18th-century history painters, the Tiepolo family. The next section is curiously titled “Mysterious Burials;” not a category that would have occurred to me. However the exhibition interestingly posits that these disparate images of burials from the Old and New Testaments are due to the “revival of the cult of the saints in 1600.” The time around the turn of that century certainly saw the restoration of early Christian churches, the Jubilee Year, and the exhumation of key early Christian saints such as St. Cecilia, so this may be plausible. In any event, such imagery here is swathed in shadow, and focuses on crypts. From a popular source for the Baroque period, the Apocryphal Book of Tobit, comes Tobit burying the dead, both in a drawing and an etching, illustrating the final sacrament. Also on view in this section is a fascinating one-off subject, The Bodies of Saints Peter and Paul Hidden in the Catacombs (1647/51) and his Resurrection of Lazarus (also 1647/51). The latter is clearly indebted to Rembrandt’s images of the same subject, especially the etching of 1632, with Christ’s head and arm in profile, gesturing for Lazarus to rise up out of the tomb. It would be hard to overestimate the Dutch master’s impact on Castiglione and in the next category, “Fantastic Heads,” this is quite evident. While Rembrandt’s variations on the fantastic or expressive head (tronie in Dutch) were influential on Castiglione, the Italian’s own renditions were widely imitated in the next century by the Tiepolo and, in France, Jean-Honoré Fragonard, master of the Rococo. 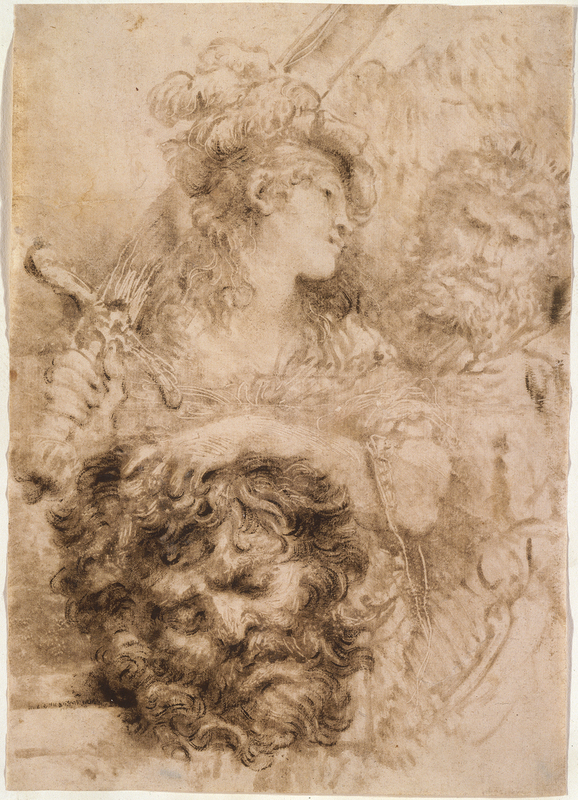 No doubt the wide dissemination of Castiglione’s Heads were due in part not only to their inventiveness, but for their central place in his work, as he etched not one but two series of heads (the Large and the Small or “Exotic” Heads, for this latter, see above left). 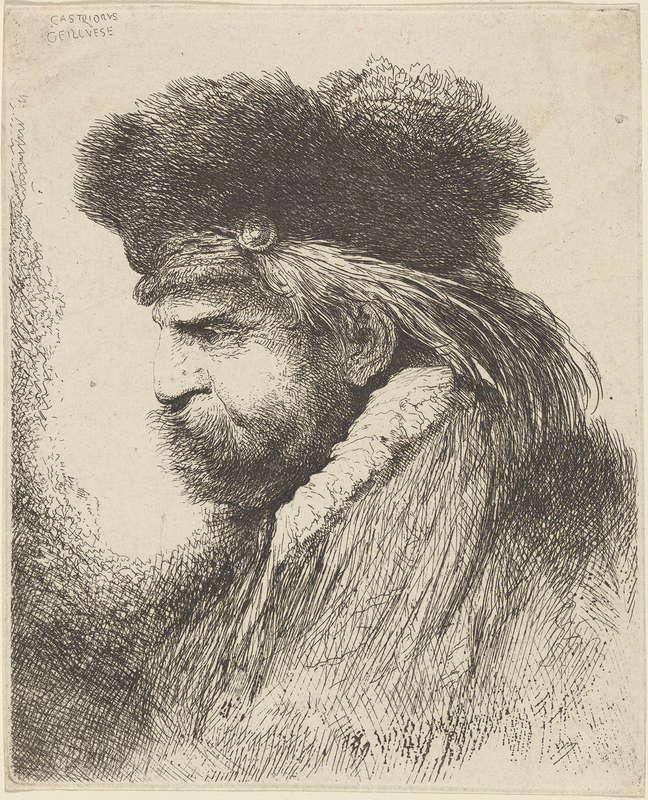 A particularly effective comparison is Rembrandt’s Second Oriental Head after Jan Lievens (1635) with Castiglione’s Man with a Mustache Wearing a Fur Headdress, Facing Left (1647/49; see above right). Most interesting—and important—is the final section on Castiglione’s experimental techniques. It is here that the artist’s contribution to the history of making art, and the high esteem in which he was held by successive generations, becomes clear. There is a very old term referring to an artist in the classic tradition as a peintre-graveur—or a painter printmaker—that indicates his mastery of these two fundamental mediums. In Castiglione’s case we must add draftsman, for not only was he a consummate maker of paintings and prints, but with him drawing became an equal to painting. He painted drawings. The exhibition is rich in these examples—it was something of a specialty for Castiglione—and he used both a wet and a dry brush to paint on paper. This technique came from Venice, such as is seen here in the Palma Giovane Deposition. More notably, he used thinned oil paint as a wash to “tone” the paper to create atmosphere, similar to his exquisite touch in inking and lightly wiping his etching plate to create varying degrees of tone in a print. Most extraordinary is Castiglione’s early use, if not invention, of the monotype. 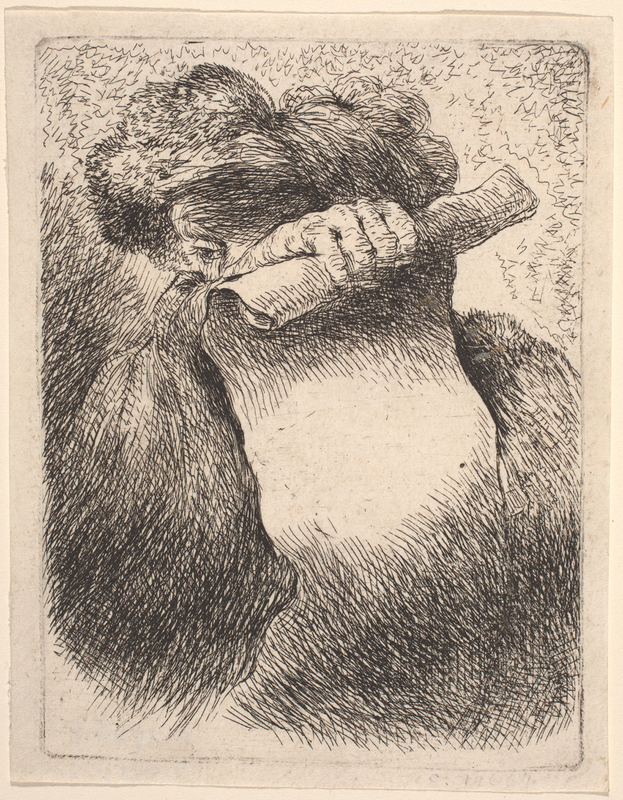 Typically we think of more recent artists experimenting with this technique, such as Edgar Degas, but centuries before, Castiglione was producing what are essentially printed drawings, achieved by painting on a surface (like a copper etching plate) and then pressing paper against it to get a transfer image. This is usually good once (hence “mono”-type), but occasionally a second impression can be gotten. One of the most stunning pieces in the exhibition demonstrates a second pull, the David with the Head of Goliath (see right). It is an elegant rendition of a grisly subject done in bravura brushwork with details scratched into wet pigment. This rare second pull further blurs the line between painting and drawing. The Baroque Genius of Giovanni Benedetto Castiglione amply reveals why we should care about him and the culture that produced him; for his sheer ingenuity, experimentalism, and indeed his modernity of approach. It is drawn almost entirely from the collections of the National Gallery, thus underscoring its sizeable contribution to this effort through its own collecting and the organization of this fine exhibition.